The logistics experts have to be wise enough to understand the importance of customisation and with a huge variation across the industries, it becomes even more critical. That’s why LP combines the specific advantages of each mode by designing innovative multimodal solutions dedicated for our customers. We are a MTO (Multi-Modal Transport Operator) & IATA (International Air Transport Association) license holder with strong presence in the world through our widespread agency network. From a small package to a huge parcel,we mark our difference by offering a dedicated approach in logistic solutions for end-to-end delivery across the world. Our understanding of the laws and documentation requirements across the countries and the handling expertise ensures a safe and flawless delivery at the promised time, cost and location. Whether the shipment is inbound or outbound, we are skilled at delivering door to door shipments, in every season, at every time, via every ROUTE. We are an IATA certified air logistics solutions provider. We understand the importance of time, the criticality of handling fragile products and high-value cargo in the air freight. We offer optimized services based on these three critical factors. Liladhar Pasoo specializes in handling hazardous goods. It requires meticulous planning, immaculate packaging and intense coordination with the stakeholder to ensure time committed delivery. With the help of our DG Certified handlers we ensure a well-ordered delivery of these critical shipments. We also provide Air consolidation services on selected trade lanes to meet up with the requirements of our clients. We go beyond ‘Port to Port’ transportation and deliver ‘End to End’ with commitment of time and cost. There is no hidden cost involved, just us and our passion to deliver with responsibility and sincerity. The JUST IN TIME strategy is of major importance in ocean freight. We adopt it to accelerate efficiency. Pre-planning the JIT strategy is of major importance in order to eliminate the wastage by receiving goods only when they are required. This strategy helps in reducing the inventory cost as well. Volume Shipping has distinct size and capacity requirements. LP is acclaimed in the industry for Volume Shipping as we offer solutions that are well planned and measured in terms of container capacity (LCL and FCL), size (arranging for the open top containers) and the risks associated with them. Providing consolidated services on selected trade lanes based on the client’s requirement is something we are adept at. We also specialize in offering premium services for both bulk and break bulk cargo. These cargoes require different handling and expertise. LP with its highly skilled team delivers them with proficiency. Logistics in its core form, has to be resilient enough to deal with complexities of road freight and shall excel in it. Liladhar Pasoo has the valid expertise in providing Road Solutions across the globe. We boast of a huge strength in terms of vehicles. Our capability and command over handling large volumes makes sure our clients do not suffer. While doing business, complying to government standards is a must and this has been our ideal throughout the business lifecycle. We comply to labour laws, child labour legislations, hazard and safety standards and ISO standards on vehicle fitness. With DG certified professionals at our service, we are dedicated to the management of hazardous goods. We also host a help desk for the management of these critical goods, ROUND THE CLOCK. ROADS have a way to be dealt with and WE build this way for our clients. Post GST, the dynamics of every business has undergone many reforms. The demand for organised warehouse, which is tipped to reach USD 40 billion by 2022, is rising exponentially. GDP has grown and with changing demographics the demand for larger size warehouse and multi user infrastructure has increased. All these factors are changing the dynamics of Contract Logistics in India. LP has a strong warehousing presence across India through its state of art facilities spanning over a million sq. 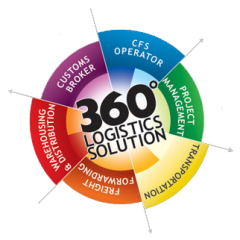 ft. LP has expertise to offer inventory management solutions 3PL services & Value-added services (VAS) in the most compliant and safe mode of operations. Handling transport, storage and delivery of goods coming in. Managing the inventory and stock. Arranging inventory in the warehouse to the best of its potential in terms of cost and space. Handling transport, storage and delivery of goods going out of a business. Updated with the security and safety standards while handling risky goods. Abiding by the Health, Safety and Environment Policies ensuring our commitment towards the environment. Complying by the HR policies to ensure a healthy work environment. Prepared with a set of important tasks on the list to make sure everything is going as per the plan in the process. Using Smart Management Information System to improve the efficiency. Focused on providing end to end delivery. LP is adept at providing efficient and clean multi-user facilities which act as a one-stop solution for warehousing. The ownership of resources and assets is made feasible with LP as we have incorporated multi-user facilities that are highly cost-effective. Our biggest asset is our own skilled and trained team& LP is committed to compliances as well as their welfare. We strictly follow the laws and regulations laid down for environment health and safety. LP is a professional organization that has its roots in India. LP henceforth understands the importance of Industrial Relations and the EHS compliances really well. A vast distribution network stronghold supported by 15000 pin codes spanning all over India, LP has the right distribution proficiency. Apart from this, a majority of our fleet is fitted with GPS tracking devices providing an accurate ETA. LP also specializes in route optimization and fixed milk runs. Considering the hassles & the cost efficiencies involved, many businesses prefer to outsource their warehousing & distribution to a third party professional service provider. These 3PL service providers specialize in inventory management & last mile reach. Accountability and efficiency is at the heart of all the operations & LP’s strong process and control helps us stand to our commitments. In our smart warehouse, all operations are connected to each other via the LP Warehouse Management System (WMS). The LP WMS is a necessary element of our large, integrated ecosystem to deliver the highest level of customized services. LP WMS is a systematic management system where every operation is system driven which eliminates errors. The WMS is so powerful that it can be integrated with the client ERP effectively making data flow seamlessly and offer a real time visibility of goods. Handling the inventory with customized processes ranging from FIFO, FMFO, Ageing, Auto Replenishment, P.O management and many tailor-made solutions gives LP a very competitive edge. LP’s vast distribution network effectively reaches over 15000 pincodes spanning all over India. Our fleet is fitted with GPS tracking devices providing an accurate arrival time at destination and in case of poor network locations we follow the conventional reporting by our trained driver at periodic intervals. Value Added Services which we offer ensures the right packing finish before it reaches the customer. An AEO-LO Certified Company skilled with the finest insights of compliance and documentation is what we boasts about, which is garnered by an unmatchable management experience of over 200+ years. Customs Clearance requires a superior level of expertise in identifying the type of commodity, its correct classification, the duty applicable. With the help of right research and knowledge base on government schemes, we advise our customers on the current norms of customs clearance whether its import or export. When an AEO certified company can boast of 200+ years of management experience, consider it primely knowledgeable and rightly skilful at understanding the departments, laws and regulations associated with your business. Our team has a supremely agile methodology to adapt to the e-initiatives started by the Government. All the functions of customs clearances and its stakeholders are integrated under one roof to seamlessly clear the goods in the shortest time possible, to reduce the dwell time of custom clearance and cost of operation. As a result of our operational understanding of varied industries we specialise on customs clearances of chemicals, agro, textiles, food, hygiene, engineering products, cosmetics and personal care. The complexities exist, many of them and so does our experience of handling, years of it. The business format of Container Freight Station (CFS) has dramatically changed off late. The core reason is the recent Government initiatives for ease of doing business where Direct Port Deliveries are encouraged. LP offers comprehensive and holistic yet highly customised packages for inbound shipments based on client’s requirements. After a hygiene yet rigorous analysis of the challenges, LP drafts solutions that are well suited and proven to be highly efficient. LP ensures that the client benefits from the better operational flexibilities so as to cater markets & last mile variability. Be it a Direct Port Delivery (DPD) – LP provides DPD hub facilities or even for a regular import shipment, LP adheres to its values of being a client-specific solution provider thus advising the most suited solutions for businesses. In parallel to the solutions offered inbound shipments, LP also offers a varied range of services for outbound shipments such as LCL consolidation or Dock Stuffing solutions. With a skilled and trained project management team, LP handles ODC and engineering cargo. The expertise to handle correct packaging, appropriate equipment for loading and unloading into the container and safe lashing and choking facilities is perfection in itself. Years of management experience & expertise in handling a multitude of clients, LP offers an overwhelming experience that adds value as well as provides customer delight. From conceptualization to execution & documentation, we arrange AtoZ for a safe and intact delivery. At the early stage, LP’s focus is on conceptualisation. Odd dimension cargo needs an expert understanding. LP, with its highly trained team plans every minute aspect needed for safe and intact delivery of the cargo. Once the planning (equipment, road survey etc.) is concluded, the next step is Execution of the plan. There are many risks associated with Odd Dimension Cargo but once dealt with patience and expertise, these factors can be controlled. LP is an expert at executing its plan with no errors. Real time challenges do occur but LP knows how to deal with them. To ensure End to End delivery is our commitment and with the help of our immaculate planning, execution and documentation (for duty advantages), we have set a benchmark in the industry. Logistics in its core form, has to be resilient enough to deal with the complexities of road freight and shall excel in it. Liladhar Pasoo has the valid expertise in providing Solutions across the globe. We boast of a huge strength in terms of vehicles. Our capability and command over handling large volumes makes sure our clients do not suffer. Safety & Legality is our prime focus. In unorganized sectors we ensure order and arrangement via GPRS vehicle. While doing business, complying to government standards is a must and this has been our ideal throughout the business lifecycle. We comply to labour laws, child labour legislations, hazard and safety standards and ISO standards on vehicle fitness. With DG certified professionals at our service, we are dedicated to the management of hazardous goods. We also host a help desk for the management of these critical goods, ROUND THE CLOCK. Beyond time comes excellence and LP excels at providing FTL (Full transport load), LTL (less transport load), Low-bed, Semi-low bed & Flat bed delivery to provide easy and flexible delivery to the client based on his requirement. Knowing that India’s dependability on road transportation is more than 60%, we provide an edge over others by giving optimised and innovative solutions to reduce the cost per delivery.